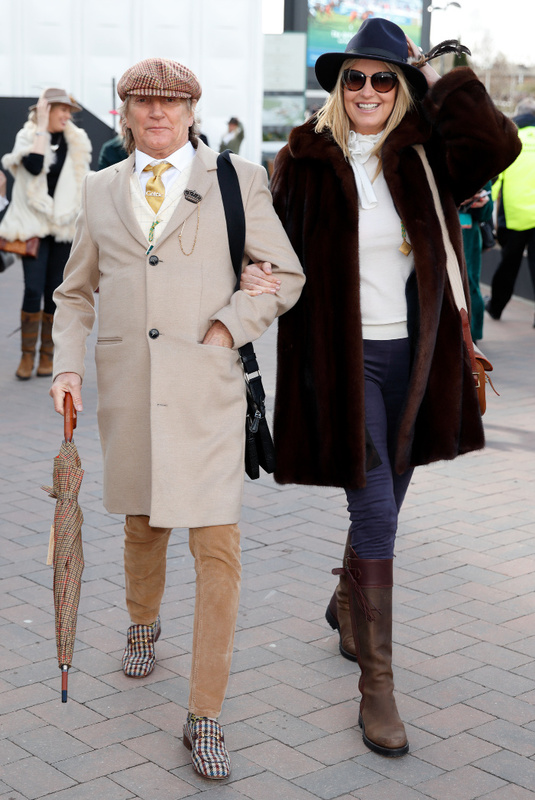 Rod Stewart and his beloved wife Penny Lancaster showed off their fabulous fashion sense as they stepped out for a day at the races this week. The sweet couple looked stylish in shades of brown and white for the Cheltenham Festival at Prestbury Park on St. Patrick’s Thursday. Rod, 74, opted for a smart pair of tan trousers which he paired with a long, beige jacket, yellow tie and a patterned cap. The famous singer came prepared with an umbrella which followed the same colour scheme. Meanwhile, Penny looked gorgeous as always in navy skinny jeans, a white top and big fluffy brown coat. She completed the outfit with a pair of long brown boots and a stylish black hat. The famous couple are often seen at the annual event which is held over a number of days in March. While Rod and Penny were all smiles at the event, they have faced some struggles throughout their time together. Earlier this year model Penny recalled the terrifying moment she assumed her son was dead after finding him face down in a stairwell following a horror fall. Appearing on the UK’s ITV daytime chat show Loose Women, the model, 47, described the experience as the most frightening of her life – made worse because her husband was hundreds of miles away in America at the time. Penny revealed she heard a loud bang moments before finding her youngest son Aiden, seven, face down and unconscious at their home after the fall. “It was the most frightening thing I’ve ever experienced in my life,” she said. “I was just off the main hallway where the main staircase is and I heard this ‘boom, boom, boom’. Huge thuds down the stairs… It sounded like a piece of furniture thrown down. Penny recalled rushing over to check Aiden, all while screaming out for someone to ring emergency services, but he was unable to speak to her and simply made groaning noises when she comforted him. Aiden was taken to hospital in a back brace and luckily didn’t suffer any serious injuries. Are you a fan of Rod Stewart and his wife Penny? What do you think of their outfit choices?